It’s finally her! The end of 2016. This year has been one amazing journey! So many wonderful things happened this year, I met so many wonderful people and got to see my little company flourish with all the love I was able to give it. For my last post of the year, I created a simple yet elegant New YEar’s Eve dessert table that you can recreate yourself for your loved ones. It’s a champagne-slash-desert bar! Pretty amazing combining two of my favorite things! I love intimate gatherings, having friends over. Especially for a special occasion like NYE. For this set up, I used my buffet table. Since we will be having a dinatoire (a fancy word for cocktail party :)), I wanted a similar idea for my dessert table as we count down to midnight. As you can tell, my color palette is my usual got to for any celebration: gold and black. Come on, who doesn’t LOVE this combo!? I kept the dessert selection simple, cake pops and cupcakes. But of course, you can add more types like cookies, macarons, dessert shots, etc. I want everyone to have fun with a drink in their hand. Let’s talk about this banner! This is a mix of Target, Dollar Store and Home Sense all mixed together. Isn’t it pretty! The last touch to this table would be the champagne and flutes. I bought these pretty flutes from HomeSense. I adore them! They are so different, so unique and so me! More champagne… Yes please! Thank you so much for reading up on my blog posts, learning all about sweet tables and desserts. I hope that you’ll join me in 2017 for more tables and celebrations. On that note, Merry Christmas, Happy Holidays and Happy New Year! May all of you be blessed with love, happiness, good health and a beautiful beginning to 2017! Until the next table, stay sweet! Thanks for stopping by! 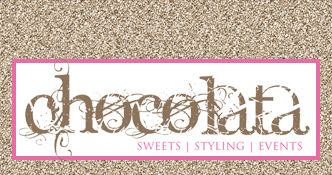 I’m May, Owner and Creative Stylist behind Chocolata - Sweets, Styling & Events. This is where you’ll learn all about my styled shoots, real parties and DIY projects. Enjoy!